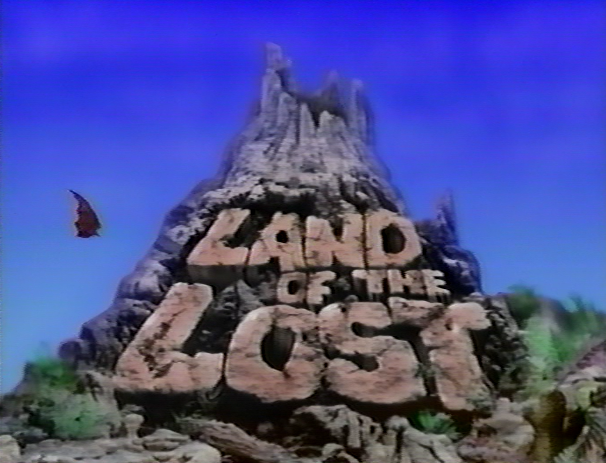 In the second episode of the Sid and Marty Krofft remake of Land of the Lost, the Porter family must contend with Kevin, who is at loose ends, and getting bored with life in the prehistoric land. As Annie reminds her Dad, she at least has Tasha to keep her company. Kevin has no one. 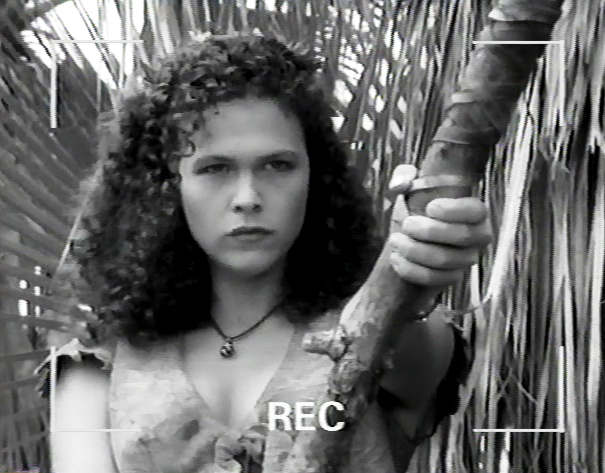 However, this fact changes rather dramatically after Kevin captures video-tape footage of two strangers in the land: a human woman, Christa, and small missing-like-type creature, Stink. The Porters attempt to communicate with the duo, but find them wary of strangers. When Mr. Porter is bitten by a poisonous lizard, Christa and Kevin must work together to find the antidote, which can be found only in a special plant very near a pterodactyl perch. Meanwhile, Annie and Tasha become friends with the Paku, Stink, as he tends to Mr. Porter. Watching this episode of Land of the Lost, I couldn’t help but consider how much better the entire follow-up series would have been accepted by long-time franchise fans if Christa had been renamed Holly, and Stink renamed Chaka. After all, we know from original Land of the Lost lore (and episodes like Dorothy Fontana’s “Elsewhen”) that Holly’s destiny was to be left alone in the inhospitable Altrusia -- no doubt unintentionally -- by her family members. This fact was shared with her by an adult version of Holly, nicknamed Rani. Thus, when the human Christa -- a human from San Francisco – shows up in this story alongside a paku named, Stink, it seems only right that the characters should actually be Holly and Chaka, still living and working together some years after Holly lost Will and Uncle Jack. I don’t know if this was the original intention (as Wikipedia seems to indicate), but it is nonetheless a superior draamtic paradigm, and would have assured deeper buy-in from old fans. 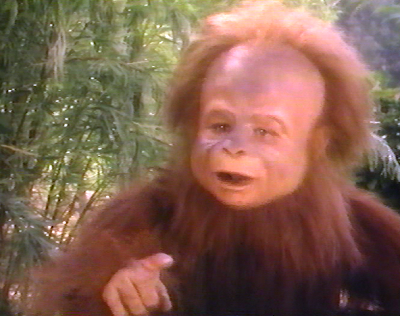 The re-appearance of Holly and Chaka would have made this series, essentially, a sequel rather than a remake. Otherwise, “Something’s Watching” feels very much like a remake of an original Land of the Lost episode, “The Search.” There, Rick Marshall was injured and Holly had to find a way to help him survive in the jungle. Here, it is Mr. Porter who is injured, while Kevin and Christa must save him, tracking down the needed plant antidote. As we saw in last week’s episode, “Tasha,” the family car is apparently going to get quite the work out in the remake series, despite the fact that there are no gas stations available in the Land of the Lost for filling the gas tank. This week, Kevin drives Tasha to find the cure, and it is apparently some distance back and forth, since the trip takes most of the day and night. The location of the cure, incidentally, is Vasquez Rocks. But the point is that the car is soon going to be useless if the Porters keep using it to resolve the crisis of the week. 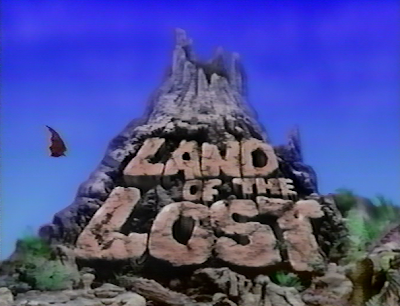 Once more, the prehistoric creatures in the new Land of the Lost are hit or miss. 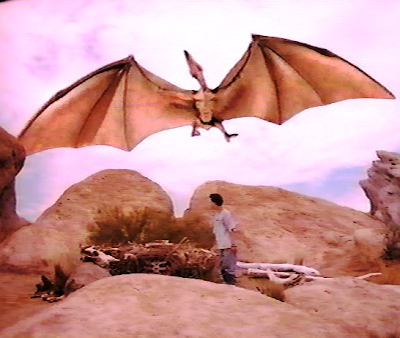 The pterodactyl looks great and moves convincingly, even if awkwardly matted into the live-action scenes. Also impressive is a gentle stegosaurus who happens into the road in front of the Porter car. But the prehistoric dogs which show up at the beginning and ending of the episode look much more cute than threatening. “Something’s Watching” is an important episode in the canon for introducing the huntress Christa and Stink, but again, these characters feel a bit like a lost opportunity to build a more direct connection between this world, and the world of 1970s Altrusia. John your statement:"...accepted by long-time franchise fans if Christa had been renamed Holly, and Stink renamed Chaka". I absolutely agree it would have been a much better option.